When my eldest was a small baby, I vowed to never let her watch Peppa Pig as I couldn’t stand the character’s distinctive snort and it drove me crazy when kids would copy it. Well, that lasted all of a couple of months. Once she had watched her first Peppa Pig tv show, she was hooked and to be honest, so was I. Peppa Pig and her mates endeared us to them completely and when my other two kids came along, we were firm Peppa fans. 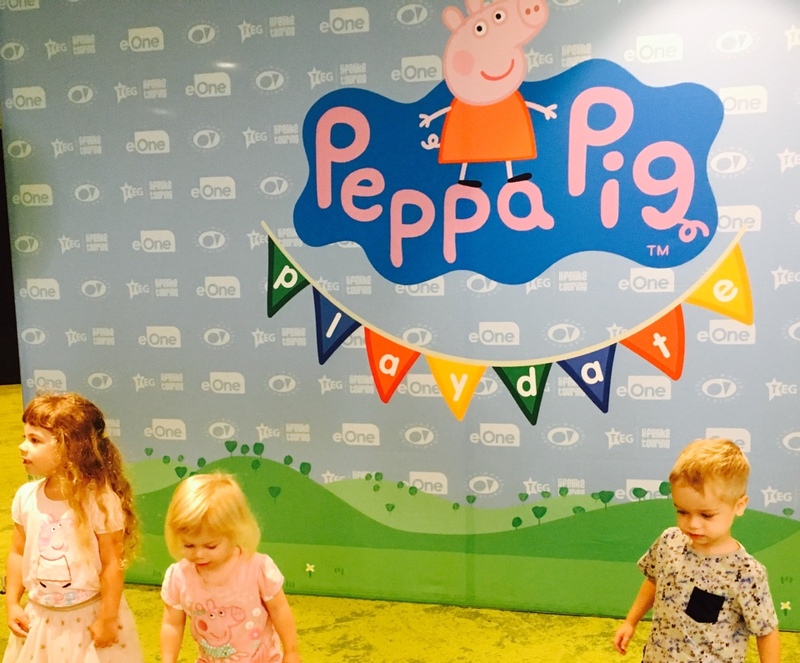 So when we got the chance to have a Playdate with Peppa Pig, our kids jumped up and down for weeks in anticipation. The event is held at the brand new ICC (Sydney International Convention Centre) and it took us a few tries to figure out where to go. My top tip is to park at Darling Quarter Car Park which offers full-day weekend rates and then walk the 2-minutes across the grass. 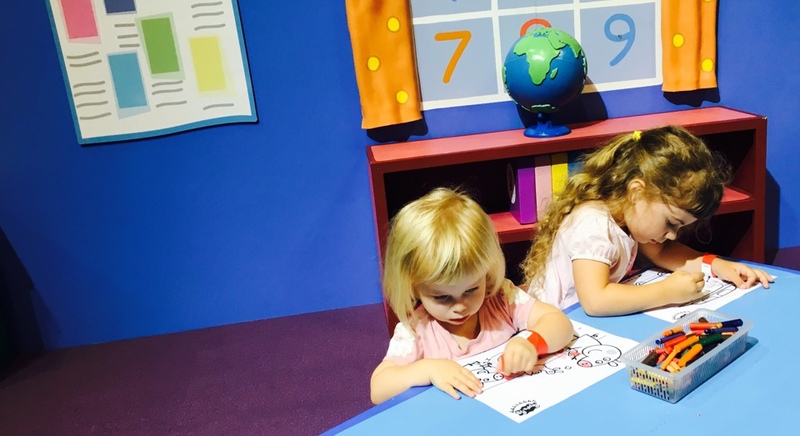 The playdate is sold in sessions and you have a two-hour block to explore all the activities. This was the perfect amount of time and our kids were completely Peppa-pigged-out by the time we left. We had priority entry for the first session at 9am, which was perfect as there were fewer people and we got to explore all the zones before the queues built up. 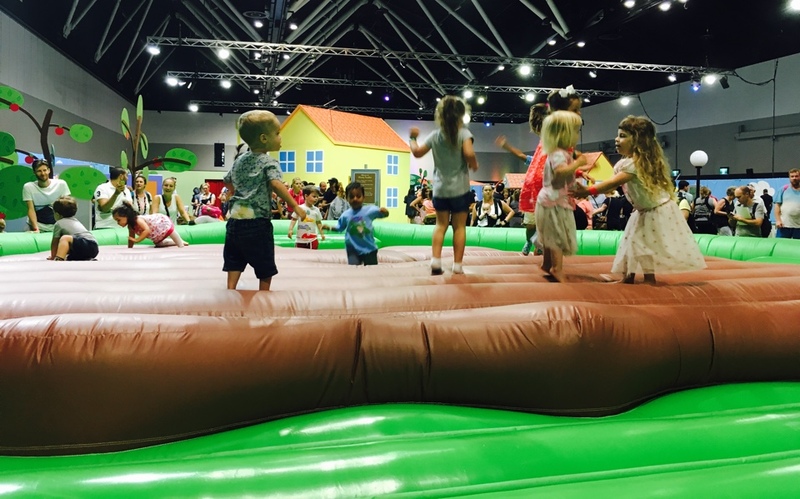 Be prepared to line up for the different activities but the venue never felt that busy and the most we had to wait was about 5 or 10 minutes for the photos with the Peppa characters, Grandpa pig’s train and the inflatable muddy puddles. There were lots of friendly staff at every attraction helping to give every little Peppa fan a turn. I recommend climbing aboard the train first as there are only three small carriages and a cheerful driver. But each ride is only about 2 minutes so the line moves fairly quickly. This was one of the kids’ highlights zooming past all the Peppa Pig attractions. Another favourite was the massive inflatable giant puddle. Each jumping session lasted 5 minutes which was enough time for the kids to exert some energy and have a blast bouncing up and down just like Peppa. There’s a show on stage every hour and this is a good opportunity for a snack break as the kids sit and watch Peppa and George dance and sing – and there are some interactive bits too. Each ticket gets you an exclusive invite to meet Peppa herself. There are three meet-and-greet spots and we were allocated The Fire Station. It’s a good idea to line up about 5 minutes before your allocated time. Once inside, Peppa came out to say hi, play a game and pose for a family photo. 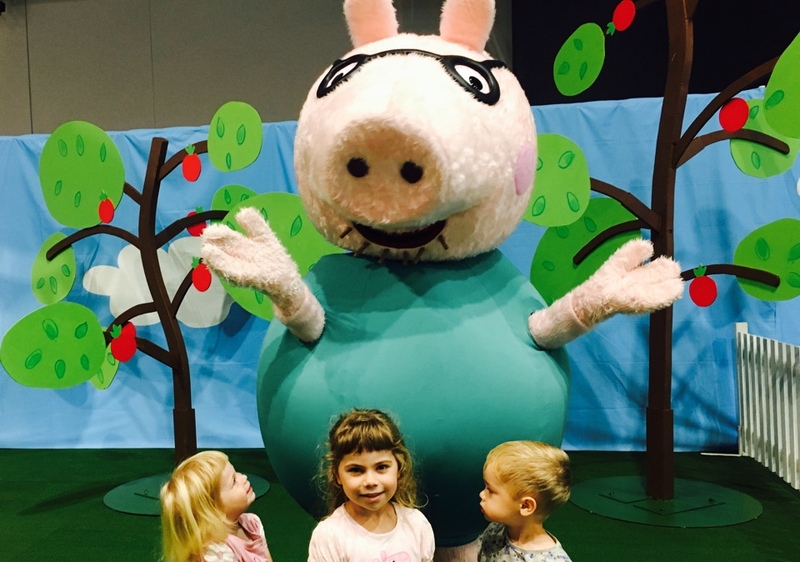 The kids adored meeting their heroine but it was all a bit rushed and I felt there could have been a bit more interaction and fun with Peppa in this more-private setting. The kids then did some cooking in the life-size version of Peppa’s house and some colouring-in and music in the craft room. There is also a big ‘pond’ with small trikes and the kids were each given a hair-net and a helmet and could ride around the lighthouse, For younger kids, there were ducks, mini-trains and other push-along toys to play with. Don’t miss having a slide or three on the big and small dinosaur slippery dip and see if you can find your way to the teepee in the centre of the hedge maze. Take a photo in Peppa’s campervan and see if you can resist pleas to buy out everything in Mr Fox’s Shop. Wow, that must have been the kids’ best play date ever and if they had it their way, they would do it all again tomorrow and the next day. Peppa Pig’s Playdate is only on until Sunday 29 January. Every child (over 12 months) and adult requires a ticket. 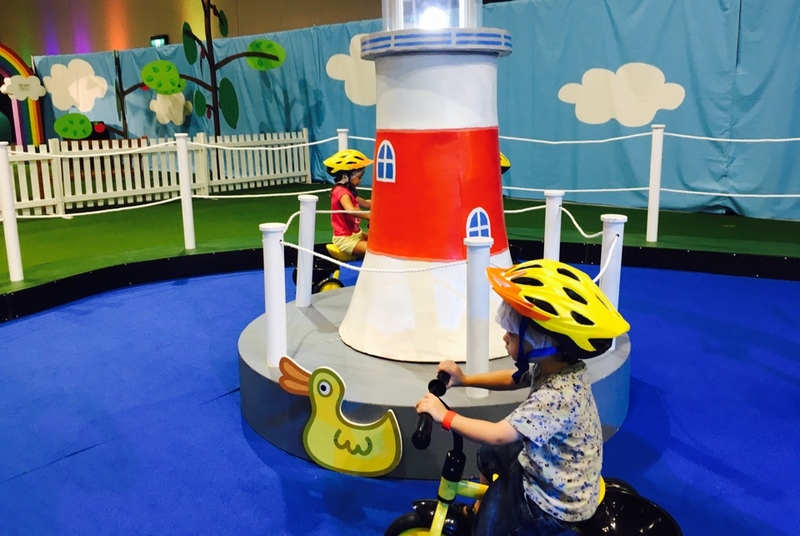 This event is perfect for toddler’s and pre-schoolers but may be a bit young for kids over 6.